The Valley TTDI in Ampang: A residential development by Naza TTDI. Even with the economy showing signs of mending, property developers are continuing to woo buyers with special housing packages/promotions to boost sales. Some of these come in special loan packages, others through lucky draws and freebies like housing appliances such as air-conditioners and wardrobes. And evidently, they are working. MK Land Holdings Bhd is one of them. Properties under the group such as Metropolitan service apartments block D, Metropolitan block D (retail and office), Metropolitan block C (residential units), Armanee Terrace block B (duplex condominium), Rafflesia phase 1 (3-storey semi-D bungalows) and Rafflesia phase 2 (3-storey semi-D bungalows) are offering freebies to buyers until end of this month. Chief operating officer Fatimah Wahab says response has been encouraging since the offers for the properties kicked off on Sept 1. “We are giving 7% discount to bumiputra buyers, early bird discount up to 5%, free kitchen cabinets with hob and hood, free air-conditioner units in the living hall and all rooms, free wardrobe for the master bedroom and free legal fees to buyers of our Metropolitan block C residential units,” he says. Since the launch of Metropolitan block C last month, she says, about 30% of the units have been sold. As for the Metropolitan service apartments block D, there is a discount of up to 10%, free legal fees, waiver for legal fee for sales and purchase agreement (SPA) and a booking fee of only RM1,000. In addition, under its “buyer get buyer scheme”, if an existing purchaser recommends someone else to buy a property from the company, the introducer will get an incentive of up to a maximum of RM10,000, depending on the purchase. Naza TTDI Sdn Bhd meanwhile is offering special housing packages and freebies for its luxury development, The Valley TTDI in Ampang. Senior general manager for marketing and sales Myrzela Sabtu says among the incentives offered to buyers are free stamp duty and legal fees, zero interest during construction, financing up to 95% and free solar heater. “The promotion, which runs from Sept 1 till Nov 1, has so far received encouraging response from buyers. We’ve manage to achieve slightly more than 50% sales to-date aided by this promotion,” she says. 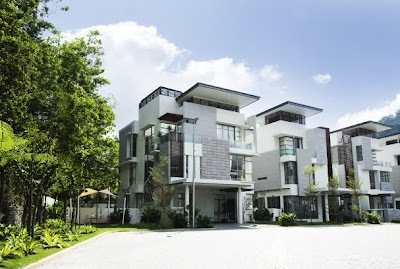 Another property developer, LBS Bina Group Bhd, is offering a lucky draw contest dubbed “I Love MyHome” to buyers apart from its LBS Hassle Free Home Ownership Programme. The contest is open to all buyers of LBS’ properties from February 2009 to February 2010. “The total prizes for this lucky draw is RM200,000. The grand prize is a Perodua Viva car while the first prize is a Kriss 120 Sports motorcycle. There are other attractive prizes to be won too,” says a LBS spokesperson, adding that the company also offers other incentives such as free furniture and fittings and 12 months security fee waiver for buyers of its Town Villa at Taman Tasik Puchong. “The incentives under our LBS Hassle Free Home Ownership Programme includes free SPA legal fees and free SPA disbursement fees. Buyers need only to pay RM1,000 for down payment,” he adds. LBS is the developer of Bandar Saujana Putra in Kuala Langat and Bandar Putera Indah in Batu Pahat. It also has projects in Cameron Highlands. TH Properties Sdn Bhd, which is developing Bandar Enstek near Sepang, is offering special packages for buyers of its De’siran (2-storey terrace) and Matahari C & D (2-storey bungalow) homes. In an email reply to StarBizWeek, chief executive officer Zaharuddin Saidon says the company is offering free SPA legal fees for both developments. “Apart from that, the company is offering free 12 months Streamyx subscription and free home alarm security system for those who buy our De’siran and Matahari C & D units,” he says, adding that the promotions are ongoing until all units are sold. Is this enough to get buyers to come out in droves to buy their properties? Maybe not but it certainly adds to the pull factor. Potential house buyer Wan Harris Amir Wan Mohamed Nor, who is an engineer, says freebies are not a priority for him. “They serve as a complement but as a first time house buyer, the most important thing for me is the financial package offered by the developers,” he says. As for Md Ridzuan Hanafiah, who is looking for a house currently, while he lauds the move by developers to woo customers, his main wish is that developers do not compromise the quality of their offerings given the soft property market. “That is most important,” he says. KUALA LUMPUR: Eastern & Oriental Bhd (E&O) is optimistic about the take-up for its St Mary Residences Phase 2 serviced apartments, says executive director Eric Chan. “Interest has been good. We feel it is timely for investors to enter the Malaysian market in view of the recent (property) rally in Singapore and Hong Kong,” he told StarBizWeek yesterday. Chan said the company had been promoting the project, launched on Thursday, in several countries, namely Singapore, Hong Kong and China, and was targeting to sell 30% of Phase 2 (or Tower A) by tomorrow. “We hope to attract buyers from Singapore and Hong Kong who ‘missed the boat’ during the property rallies in their respective countries,” he said. St Mary Residences is located at the heart of Kuala Lumpur’s central business district along Jalan Sultan Ismail, Jalan P. Ramlee and Jalan Tengah. Tower A will comprise 288 luxury condominiums. The units are smaller than most serviced residences within the KL city centre, with its one-bedroom units starting at 1,100 sq ft.
“Since the global financial crisis, rental budgets for expatriates have been slashed. St Mary Residences offers smaller but luxurious units at lower rentals, yet the units have a spacious feel,” said Chan. The one-bedroom units are priced from RM1.1mil. Phase 1 (Tower C) was targeted at mostly local buyers and E&O achieved a 75% take-up rate in just 10 days when it was launched in June, Chan said, adding that he did not expect a similar rally for Phase 2. He said the local property was still a favourable investment for foreigners despite the current economic downturn. “Malaysia has a sound financial system, stable economy, low cost of living and a favourable exchange rate. What’s more, properties here are among the cheapest in the region. “With the recent economic stimulus and liberalisation policies, we expect a lot of foreign direct investment for Malaysian residential properties,” he said. E&O will also be offering attractive packages (for Phase 2), such as a 10:90 financing scheme, zero interest during construction, free stamp duty upon transfer and free loan legal fee. There will also be 34,000 sq ft of retail space that will be annexed into Tower A. “We are looking at setting up a spa, laundry and food and beverage centres – outlets that would add to the convenience of our residents,” he said, adding that Towers A and C would have a combined gross development value of RM750mil, and construction was expected to be completed by 2012. Malaysians can count ourselves lucky as the country is sheltered from major natural disasters such as typhoons and earthquakes and we have relatively safe abodes and buildings that do not easily collapse when there are tremors. We are also not near the Pacific Rim of Fire that is notorious for huge earthquakes and tsunamis although we could still feel tremors during Wednesday’s earthquakes in Samoa and Indonesia. Earthquakes measuring 7.6 on the Richter scale in Sumatra and 8.3 in Samao resulted in many fatalities and extensive damage to buildings. With the increasing frequency of such natural disasters, it is important for local property industry players to look for ways to reinforce their projects and incorporate more safety measures to ensure the property they design and build, especially high-rise buildings, are able to withstand tremors and earthquakes. Facilities to accommodate mass evacuation of occupants of high-rise buildings should also be a top priority of building designers. As big earthquakes are usually followed by tsunamis and high waves, property should not be built too near the shorelines and there should be high reinforced walls as a first line of defence to shelter these property should another tsunami like the one in 2004 strike. Otherwise, generally the country has quite a conducive environment for the people to enjoy a good standard of living, at a relatively affordable cost. Although there is still room for improvement in the country’s infrastructure system, we should be thankful for the clean water, regular electricity supply, and good roads and highways, among other things. We will appreciate what we have better by visiting other “less privileged” countries. As far as housing is concerned, the people have a wide choice of residential property to choose from. They can either opt for high-rise living or stay in landed residences in the many housing schemes. Hopefully, prices of goods and services will not skyrocket once the economic downturn caused by the global financial crisis is reigned in and the economy returns to growth. We should learn from the experiences of other countries whose economies have suffered badly due to excesses which included over-priced and over-speculative property markets. The massive loans taken out for property purchases and the resulting sub-prime loans would not have happened in the US if the banks there had been more vigilant in ensuring only those who have stable income streams and ability to repay their loans are approved for loans. So, our well regulated banking system that required a lender to be employed or has a business with a minimum level of monthly income, has at least one guarantor and collateral to support their loan application, could have saved our financial system from a systemic failure this time around. Prudence is the key word and should not be compromised for high business turnover. As far as property prices are concerned, the global crisis would not have resulted in such major losses in the property value like those seen in some major European cities had real estate prices remained anchored to fundamentals. Property prices are a function of demand and supply and a host of other factors including the people’s purchasing power and their affordability, prospects for growth of an area and standard of infrastructure facilities. So far, property prices in the country have been reflective of actual market situations and have not hit the roof like those in some countries. Both buyers and developers have important roles to play to ensure the market stays balanced and does not move into either extremes of a spiralling downward or upward trend. Whether the global economy manages to pull off a V-shaped recovery or has to contend with a double V (double dip or W) will only be known in the coming months or possibly years. With such uncertainties, there will still be caution in the market and the people will continue to watch their expenditure. Developers should always strive to raise the standards and quality of their property products to ensure they are saleable as buyers today have many choices to choose from. Needless to say, industry players that continue to innovate and are trendsetters in the various market sectors – from the lower priced to medium and higher-priced projects – will stand out from the rest to attract buyers. Deputy news editor Angie Ng is appreciative of her landed residence and will not be moving to a high-rise dwelling any time soon.